Today is one of the days that I appreciate how lucky I am to be free. Free with much more than the basic necessities. I guess with Thanksgiving this past weekend in Canada, it gave me a chance to reflect on that. How the fact that I am not faced with sickness. That my water is clean. My house is ours and no one can take that away. That even though we do have oppression and cruelty in our country, both to the poor, and marginalized, but I rarely suffer. This wealth that I have is something that I can't take for granted, as sometimes I feel I do. More importantly, people around the world can't take it all. They suffer from despicable acts of torture, pain and suffering. 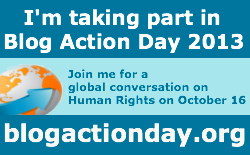 I don't believe that it is their fate, and that's why I'm acting today to participate in Blog Action Day. Perhaps my voice alone means nothing, but I'm confident that with the multitude of voices today, it will. Especially for what I'm most concerned about. More than half of Nairobi’s population live in extremely precarious circumstances in slums or informal settlements. Due to lack of proper planning, many of these settlements occupy land designated for non-residential purposes including roads or railway lines, or land that is privately owned. Nairobi’s slums often lack security of tenure thus increasing their vulnerability to forced evictions, the effects of which are devastating to their lives and livelihoods. The report calls on the Kenyan authorities to provide effective remedies for victims of forced evictions and for long term measures to ensure that evictions, where justified, are carried out in a manner that is lawful and respectful of human rights.